Product code: ES8205 Categories: Antique, Antique Rings. Antique rings are so often much more individual than modern mass produced rings, and here is a magnificent antique ruby, pearl and diamond ring with a secret locket under the top that is so unique and special. 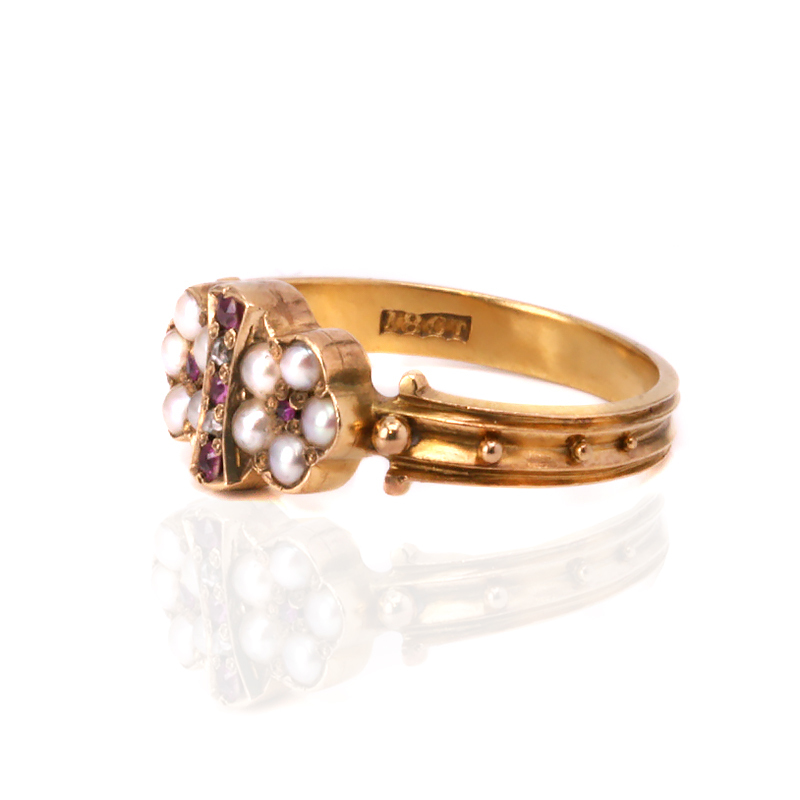 Dating from the Victorian period of the 1880;s, this ring was made in 18 carat yellow gold and is set with rubies, diamonds and pearls. However it is not just the gemstones set but also the design that makes the top of the ring so beautiful. There are three rubies and two diamonds on the top running in a line and a cluster of pearls surrounding a ruby set on each side. This top section measures 7mm wide at the centre by 15.5mm across, then leads to the elegantly designed band adds so much more character to the ring making it look even more unique on the finger. And then turning the ring over shows a feature of this ring that makes it even more special and so unique – a hidden secret locket. If only this ring could talk about its history there would no doubt be some romance involved. This locket section is so charming and poignant and will make this ring such a fabulous and intriguing talking point. From any angle that you look at this ring, it will be so hard not to fall in love with its history, romance and design. Tags: Antique ruby, pearl and diamond ring with a secret locket. This antique ring dates from the Victorian era of the 1880’s. Set with natural pearls, rubies and diamonds, there is also a locket compartment under the top of the ring. Antique rings often have such unique features that are no longer found in mass produced modern jewellery, and this ring certainly exemplifies this.